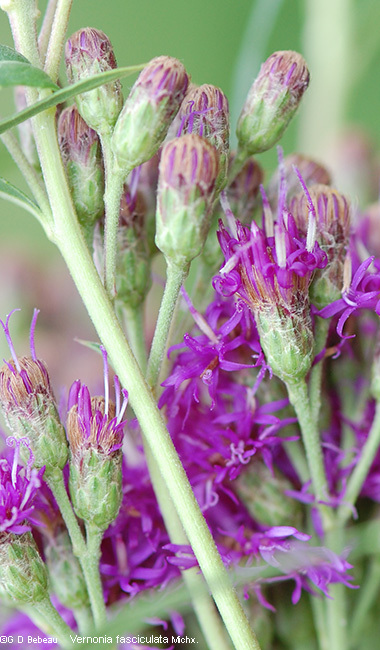 Ironweed is an erect native perennial, growing 2 to 6 feet on a stout, hairless stem (although some plants may have a very fine short hair) that is light green to reddish purple in color. It is unbranched below the floral array. 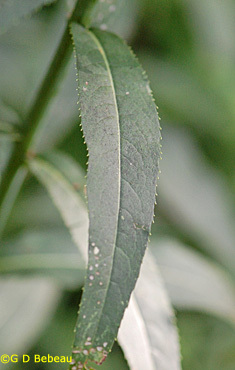 Leaves are mostly all on the stem, alternate, up to 5+ inches in length, lance-like with a sharp toothed edge (serrate), hairless, with the underside having a prominent central vein and a pitted surface while the upper side is resin gland-dotted. Leaves are stalkless. The floral array branches into flat dense clusters, a corymbiform array, 1-1/2 to 4 inches wide of small disc florets that are violet-purple. Stalks of the flower cluster may have fine hair and a few green bracts. The individual flower heads have 12 to 25+ florets which each have 5 lobes which spread and reflex when the floret opens. The style has a divided tip and is surrounded by the five stamens. The flower head is bell shaped (campanulate), 5 to 7 mm wide, and is covered with 25 to 35+ green phyllaries with the appearance of fish scales which may also have fine hair. These are arranged in 4 to 5 series. The outer series is more lance-ovate in shape, the inner series more linear-oblong with pointed tips - the inner most tips have a purple coloration. 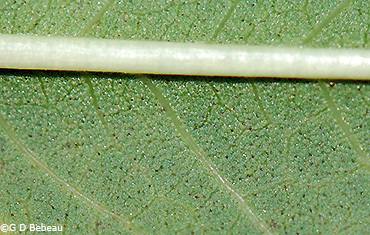 Floret peduncles are 1 to 8 mm long. Seed: The flowers mature to a dry seed (a cypsela), 3.5 to 4 mm long, attached to brownish-purple pappus of hair like scales, which are carried by the wind. Seeds require at least 60 days of cold stratification for germination. 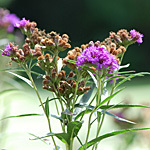 Habitat: Ironweed grows from a rhizomatous root system in full sun in wet to moist fertile soil. It accepts partial shade. It is not an aggressive spreader. 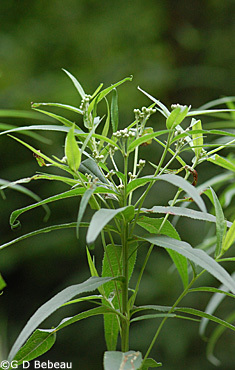 It is a common pasture plant as herbivores avoid its bitter taste in preference to other plants. Along field edges and railroads the plant will also be found. Butterflies and long-tongued bees are attracted to it, but also the caterpillar of the Ironweed Borer Moth, Papaipema cerussata. 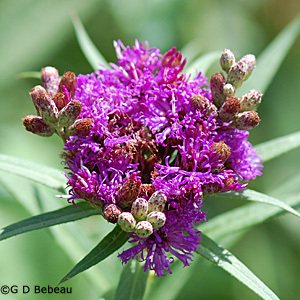 Names: The genus Vernonia is an honorary for William Vernon (d. ca 1711), English botanist who collected plants in Virginia in 1698. The species fasciculata, means 'grouped together in bundles', such as the flower heads on this plant. The plant author name for the plant classification, ‘Michx.’ is for Andre Michaux (1746-1802), French botanist who made many exploring expeditions in the U.S. collecting and cataloging many species. Two important works of his are the Histoire des chênes de l'Amérique septentrionale (1801 - Oaks of North America), and the Flora Boreali-Americana (2 vols., 1803). His son Francois, traveled with him and the father’s notes were later used for the 3-volume North American Sylva, for which Thomas Nuttall provided some supplements. 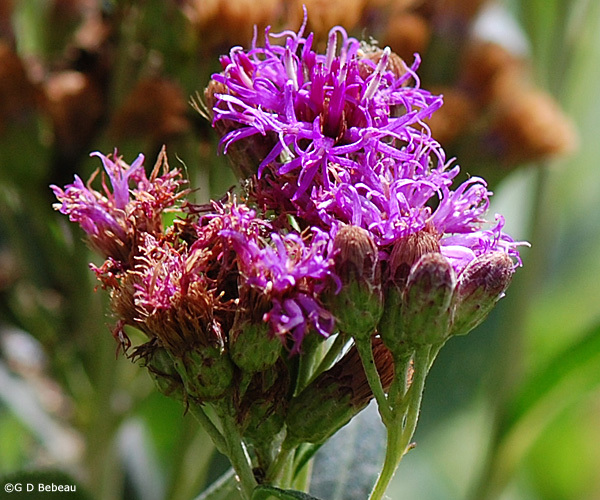 Comparisons: There are 17 species of Ironweed found in North America. Of those only one is recognized as being in Minnesota - V. fasciculata. 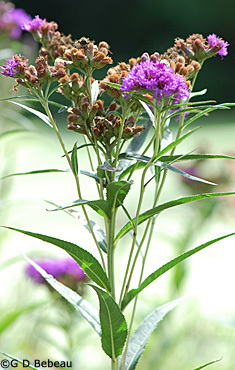 A second, V. baldwinii, Baldwin's Ironweed, was listed in some references as being in the State, but not by current authorities at the DNR and the U of M. The latter has flower heads that are more rounded and less bell-shaped, the underside of the leaf is not pitted but is resin-dotted, and the phyllaries are often resin-dotted, but you are unlikely to run across it in the state (see notes below). Most Vernonia species hybridize with each other. 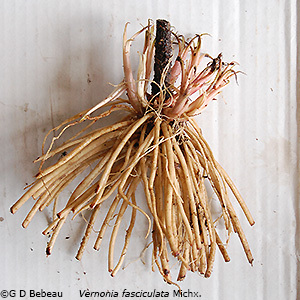 The closest look-a-like species of Vernonia is Vernonia marginata, where the main difference is in the floret where the phyllaries have tips abruptly pointed, floret peduncles (stalks) are longer - 10 to 35 mm, and the floret involucre is also longer - 9 to 11 mm. This species is only found in the southern Great Plains of Colorado, New Mexico, Kansas, Oklahoma and Texas. In coloration but not in shape, the floral array resembles Spotted Joe-Pye Weed. Above: 1st photo - The floral array in August bloom, branching from the main stem. 2nd photo - In the early bud state at the end of July. 3rd photo - The sessile leaf with serrated edges. Below: 1st photo - Irorweed is a tall plant - seen here in flower. 2nd photo - The lobes of the purple corolla tube reflex when the floret opens. The phyllaries are in a series of 4 to 5 around the flower head, the outer more ovate, the inner more linear with pointed purplish tips. Below: 1st photo - The flowers of August. Note the flower's resemblance to Blazing Star. 2nd photo - The seeds are forming in late September and the purplish pappus is visible. 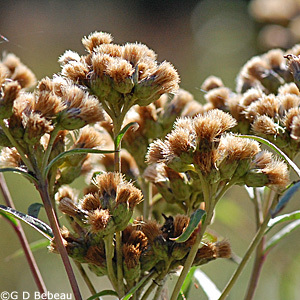 Below: 1st photo - Ironweed grows from a rhizomatous root system which can lead to the formation of small colonies of plants. It is not considered aggressive. 2nd photo - The underside of the leaf which has a prominent central vein and a series of very small pits (dark spots). Notes: Eloise Butler recorded planting Ironweed on Aug. 21, 1912 and on Aug. 28, 1914 - plants obtained in Mendota MN, others in 1916. Martha Crone recorded planting it in 1933, '35, '36, '47, '47, and it was listed on her 1951 Garden census. However, it was not on the 1986 census, but has since been replanted. 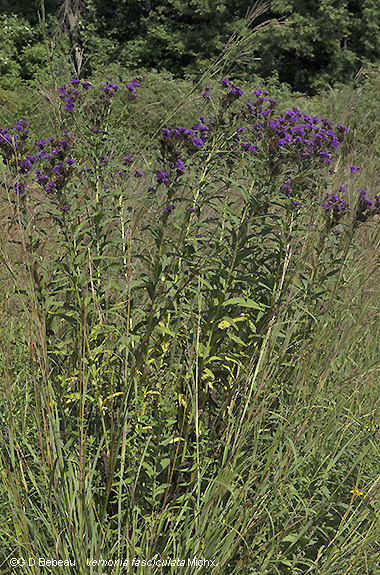 Ironweed has historically been divided into two subspecies (corymbosa and fasciculata) with differences in range and slight plant differences. These are no longer accepted by most authorities, including Flora of North America, as they are now described as simple variations of the same species. Within Minnesota Ironweed is found in most counties except the NE part of the state that are north and east of a diagonal line running from Kanabec county NW to Marshall - 64 counties in all are reported to have the plant on the DNR Census. Neither the DNR nor the University of Minnesota Herbarium recognize the subspecies. Medicinal lore: There are brief references, particularly in Hutchins (Ref. #12) , as to the use of the bitter root and the leaves as a tonic and alterative including physicians using it a treatment of dyspepsia and that a decoction of the leaves was quite useful as a gargle for sore throat.